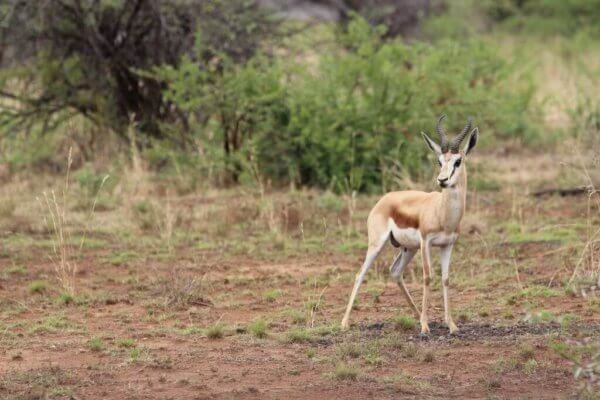 Chances are high that you will get to see springbok during your trip to Namibia. They are the most abundant animals in the country and you may even spot them in the farmlands along the road to your accommodation in Windhoek. They are equally at home in the harsh environment of the Namib Desert, or protected within private game reserves, but the largest population of springbok in Namibia lives in Etosha National Park. Springbok do not rely much on water for their survival but they do tend to follow the migration patterns of other animals in the wild. As the other species move around in search of water, the springbok tag along, and they are usually seen in the company of other plains game, especially zebra and wildebeest, within nature reserves and parks. Their low-water requirements mean that they are well-adapted to Namibia’s harsh conditions. They are able to switch between browsing and grazing at will, and even eat roots, tubers and flowers if necessary to meet their moisture requirements. Springbok usually feed at night when the water content of plants is at its highest, due to increased humidity. Springbok are thought to synchronise the birth of their young to coincide with times of plentiful grazing. The gestation period of the springbok is 25 weeks and they keep their new-born fawns hidden for the first month of their lives. After that, the youngsters join the herd and are completely independent by 5 months, although females will remain with their maternal herd until wooed away by an appropriate suitor. Young males head off on their own to form bachelor herds and ultimately establish their own territories. A territory is vital for a male if he wants to attract a harem of his own, and many fierce battles occur between males over their land rights. The springbok is distinguished from other gazelles by the pocket-like skin flap that extends along its back towards the tail. This flap is raised when the antelope leaps into the air in its characteristic bucking jump, emitting a sweet-smelling odour which assists in keeping the herd together while on the run. Being an almost-gazelle, the springbok is the only member of the genus, Antidorcas, meaning ‘not a gazelle’. The second part of the classification, marsupialis, refers to the skin flap. Take some time to enjoy these unique animals on your next Namibian safari.